There are two separate segments of the mold industry: the mold remediation companies and the mold inspection and testing companies. They are not competitors. The two work together to resolve your mold problem. Not only is it considered unethical for the mold remediation company to do the inspection, but in some states, it is actually against the law. In fact, the U.S. Environmental Protection Agency has weighed in: “Sampling for mold should be conducted by professionals who have specific experience in designing mold sampling protocols, sampling methods, and interpreting results.” You need to be confident in the inspection protocol and results, and that can only happen when the inspection is conducted without a conflict of interest. 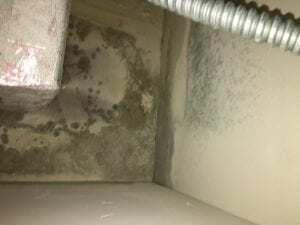 If you sense or see mold, the first line of defense is the mold inspection company who will determine the species of mold, the extent of the problem and the most efficient and effective procedures for the mold remediation company to follow. Knowing how far the mold has spread is critical to the remediation process. If too small an area is treated, the job is going to have to be done all over again in the near future, which leaves you needing to deal with the inconvenience of remediation again and which increases your cost. If too large an area is treated, you have incurred unnecessary costs. The inspection company’s report ensures that you pay no more than is necessary and that the work is done properly the first time. The mold inspector will also go over the whole house with a moisture sensor to find the exact spot(s) where water is seeping into the house, whether visible, such as water in the basement, or invisible, as many roof leaks are. You will know exactly what has to be repaired before remediation. To have remediation done without the source of the mold eliminated is a fruitless, and expensive, project. The inspector will also check to see if the ground slopes toward or away from your home, if there are cracks in the foundation, what the material of the roof is, if there are areas of the home that are excessively humid and if your HVAC is properly maintained. The mold inspection company can work with the remediation company throughout the project and do the post-remediation inspection.